Discussion in 'Mapping Questions & Discussion' started by Whoop, Apr 23, 2016. I've recently been testing out a new map of mine on a VPS server my friend and I set up. Everything has been working perfectly so far and I've hosted several beta map testing events on it already, but recently something I changed in my map makes it unable to be loaded by the server when I try to switch levels. All other maps work fine and I've troubleshooted a lot with other custom maps, so it's definitely something I changed in my map. The server appears to be not finding the file path, so I checked the tf2/tf/downloadlists to find that my maps .LST file is being written blank every time I try to load it, but it definitely doesn't do this to any other maps - even other ones I made in hammer. I can't for the life of me figure out what I did is causing this problem seeing as it works fine with every single other map. What the hell did I do wrong? I was supposed to have a beta testing event tonight, but it looks like that's not happening. Yup, I've tried with tons of different map names. Same result every time. Did you rename the vmf before compiling or rename the bsp after compiling? If you did the latter, it can cause the bsp to become corrupted. I've never actually renamed the file, only saved as a different name. So that's a no. Plus it works on my local client so its probably not corrupt completely? 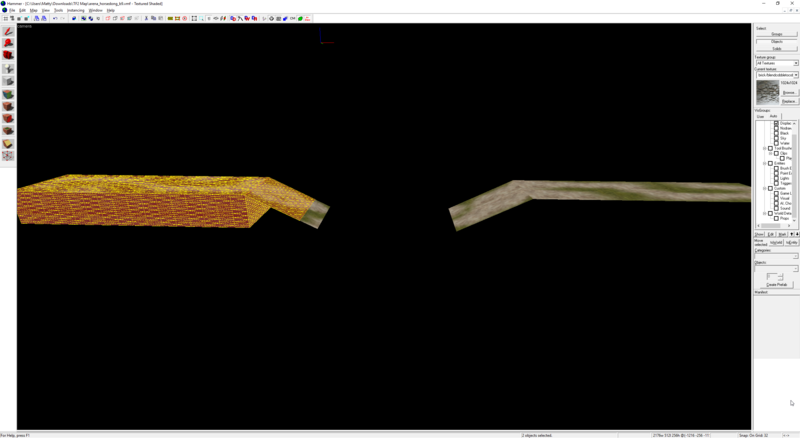 Could you provide a VMF from before you cut the map in half to mirror it? ALSO: does the server return any errors when you attempt to load the map, or what? Sorry for the slow response, this is the last known working version of my map, and here is a link to the server log where it goes wrong. Sorry it's only screenshots, I cant copy on the interface. 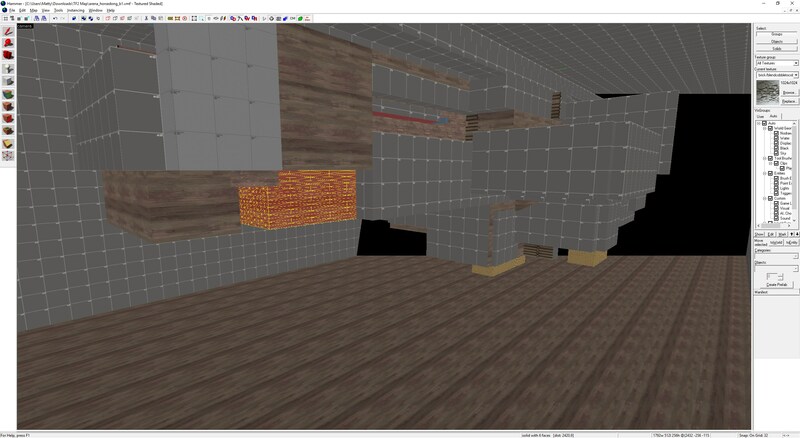 I also tried copying my whole map in hammer and pasted it into a fresh .vmf with no success. Same error happens. It definitely has to be something in my map, right..? But deleting all the entities doesnt fix it, so it must be something with the copied geometry. I'm considering just remaking the whole blue side from scratch which is what I was kinda trying to avoid in the first place, but oh well. That's very strange and I can only imagine you somehow ended up with some weird broken geometry. I'm not sure if it is specifically the issue but be aware that maps require an info_observer_point or, if everybody dies (and this is arena mode so that tends to happen - maybe even in the initial waiting for players), then the server will crash. That's a neat little trick, thanks you. I essentially did the same thing though so IDK where it went wrong. Still helpful in the future though. Didn't know that could happen, we had been playing it just fine without them, but thats good to know. I just tried my map with one set up though and it still doesn't work. Honestly this is a really peculiar issue you're running into, I can't at all think of what the issue might be because I had a look at your VMFs and the logs and I can't find anything wrong. I'm a little confused. b9 is the last known working version, but b1 is the one that doesn't load? My understanding is that this refers to collision, possibly the collision hull of a player, which uses 'Q Physics' or 'Quake Physics' - one of the two physics simulation options in the Source engine, the other being VPhysics. QPhysics is what brush entities and players use, because it's cheap. It may be that the game performs physics calculations as it's loading, and in this case it's found something it dislikes. Some errors in your compile logs, coupled with the search result forum chatter on the web drew me towards displacements being a possible cause, so I opened up your VMFs for b1 and b9 in Hammer. Your displacements are using power-4 division. 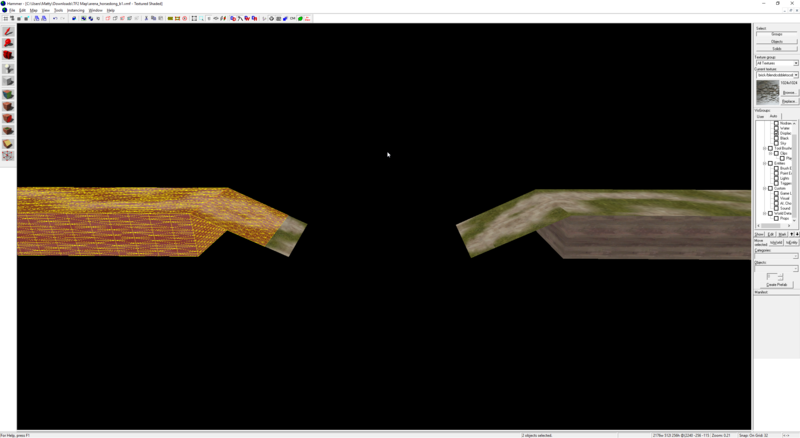 They are using up many more triangles than are likely necessary, especially for such simple landscape gradients. They use more memory, and they can cause crashes when a physics object hits them. It's no crime to use them but they are best avoided. The selected displacement brush to the far left is still a cube. You have made each of its faces a displacement, though only the top is ever seen. As a result, the sloping displacement's top edge is sharing the edges of two other displacement faces, which is causing the 'Displacement abutting' compile error. In version b9, one side doesn't have this issue, resulting in less power-4 displacements in the map, and only one case of edge abutting. ProcessBSPDecal: Trying to project on world before host_state.worldmodel is set!!! Warning! Static BSP decal (??? ), on NULL model index 0 for entity index 0. I'm not sure why this is happening. You have two infodecals in your map, so the quantity tallies up right. But I haven't found fault with their placement or configuration in Hammer. It may be something you can ignore but experience tells me it should be investigated. As a side note, your map lives in a big box. You should remove that and properly seal your map. Not that it makes a great deal of difference at this stage, but it's helpful for debugging, as it's one less potential contribution to further problems. At TF2maps, we tend to use the Beta stage for detailing, so layout and visibility optimisation would normally be settled before moving out of Alpha. I hope we get to play test your map. I thought some of it seemed interesting, especially the chute. Thank you all so much for your help! @worMatty helped weed it with his section on displacements. When I deleted the old dirt floors and created new and better displacements based on his recommendations everything seems to work fine now! I'm guessing the displacements got really glitched somehow when I copied them because they were actually supposed to be identical, but apparently not. I can't wait to take all of your guys' feedback into account and get back to testing and improving my map though! It's been a several years since I touched hammer and its cool to see there's still nice community of people willing to help each other out. I'll make sure to post the map after making some improvements. I'm guessing the displacements got really glitched somehow when I copied them because they were actually supposed to be identical, but apparently not.